Many of our objects have fascinating stories behind their survival and donation. The veneration of relics and reliquaries is an ancient Christian tradition with roots in the Old Testament. 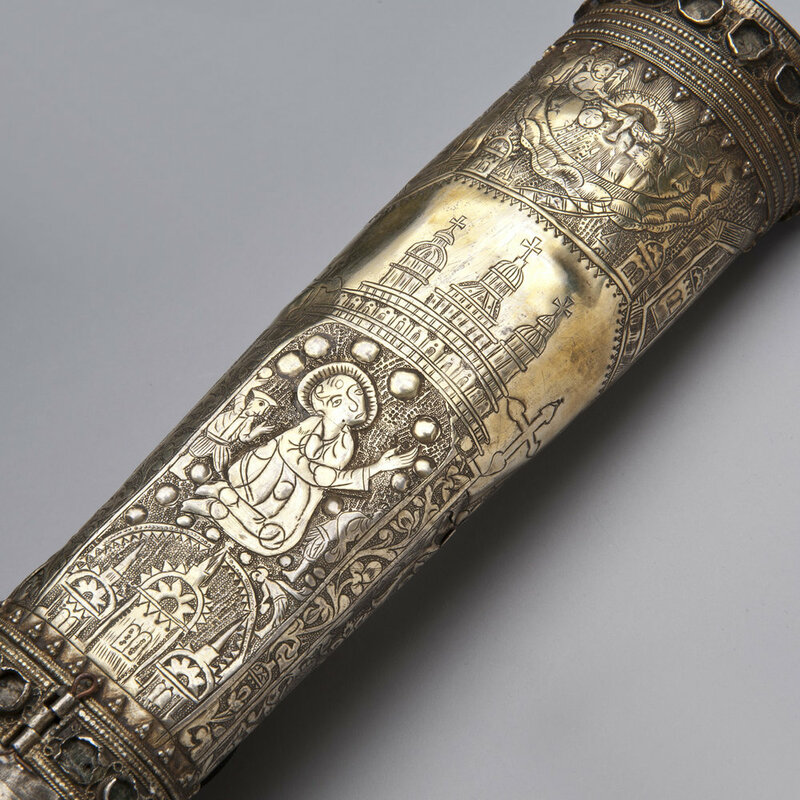 In Armenia these holy objects were usually safeguarded in churches, monasteries, or in surb tann. In a village without a church nearby, the villagers would create a shrine for the village surb tann ("house saint"), a holy object (e.g. bible, relic, liturgical vessel, stone from a sacred site, or other objects associated with God). The surb tan would become the devotional focus of the local villagers, as a physical reminder of the power of God. In 1916, Aghavny Demirjian's mother escorted a friend to a Russian border crossing. At the border station the Russian soldiers were searching each refugee and confiscating any valuables as they crossed. Two Armenian women standing next to the mother turned and passed a hidden package to her, whispering that it was an Armenian holy object. They begged her to take it and save it from the Russians. The two strange women and her friend were then searched and crossed over the border, while the mother returned home with the package. 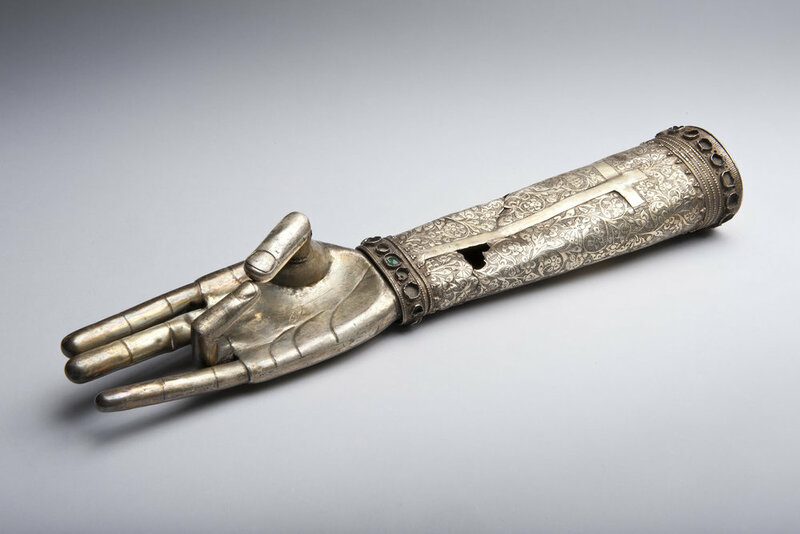 Inside she found the hand reliquary and believed the odd border event to be a sign from God charging her personally to protect the Hand. 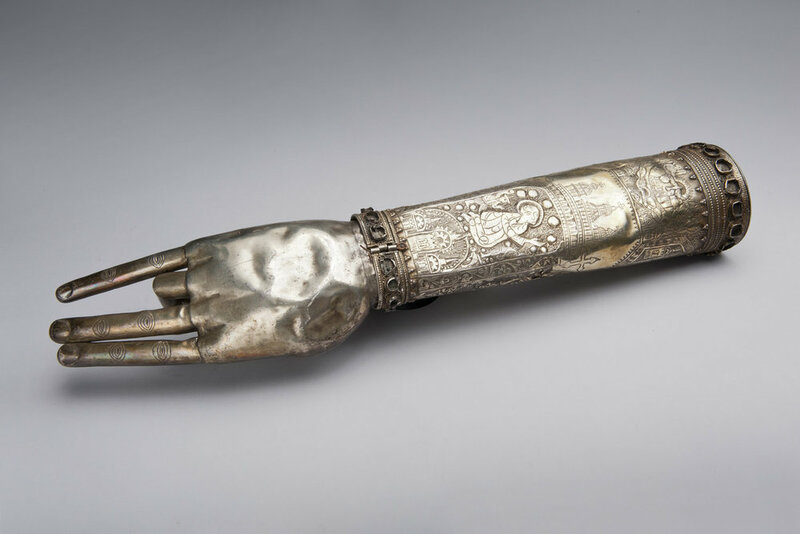 The mother later immigrated to the United States, bringing the Hand with her and creating a small shrine to house the Hand in her bedroom in Rhode Island. A converted armoire became a traditional American surb tann, decorated with dried flowers, candles, incense, religious pictures, holy oil, a prayer scroll and Eucharist wafers from the local Armenian church. Each day she would pray at the secret shrine and put out fresh candles and incense. Upon her death, her daughter continued the family tradition of maintaining the secret shrine, hidden from all outsiders. The daughter died recently and the reliquary was a bequest to ALMA. It is now on display in the Gandzaran ("Religious Treasury") Gallery on ALMA's first floor, where it can be seen by the public for the first time publically in 92 years.